Will be charged for the first night. Located in the heart of the city, within walk-able distance from places like Starbucks and The KBR National Park, We are right opposite to KBR National Park where lot of Joggers and Walkers spend there morning time. 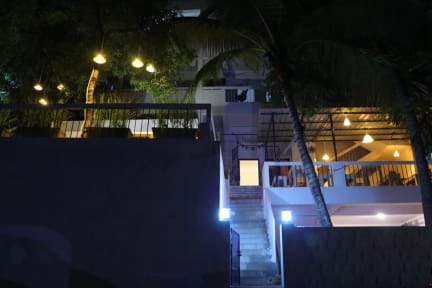 - Jubilee Hills Rd No 45 - 1 KM known as the party street of Hyderabad holding Restaurants, Night clubs and Local Breweries. - Puri Jaganadh Temple - 2 km. We have standard rooms which are air conditioned. The curtains, bed sheets and cushion covers used are produced and manufactured in our very own state by which you are introduced to the arts and culture of Telangana. The hostel has mud/clay pots and bottle. Interesting place, and a crazy awesome host! The place is beautiful at night and the rooms are super clean and well organized. The Hostel is in a very good location. Transport is easily available. They have a fully functional kitchen in case you want to make your own food! Good place to hang out. A great place to be at. Amazing hosts. You get to meet amazing people. The place is located at the heart of the city. The people who run the hostel are the best. They are very active in social causes and often open their property up to meetings amongst young people who are organizers in a movement - very cool and very accessible! As for location, it is in Jubilee hills, which is the most expensive and poshest area in Hyderabad. It’s located close to ATMs and nearby markets. There are stands where you can buy street food. You will most likely need to download Ola to get around by auto taxis or car taxis. 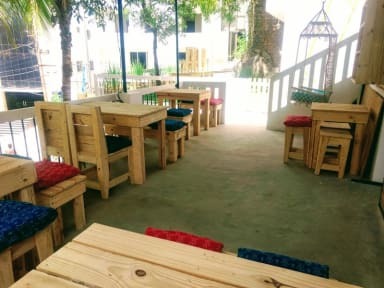 Amazing place, best hostel experience so far in India, famelystyle cooking, nice tarrace, sweet staff, cool guests 🙂 The location is in a nice chill nabourhood, theres cool bars and restaurants in walking distance, it's a bit far from the touristy stuff though. Shepard Stories is not the best hostel ever, but it is probably the best hostel in Hyderabad.